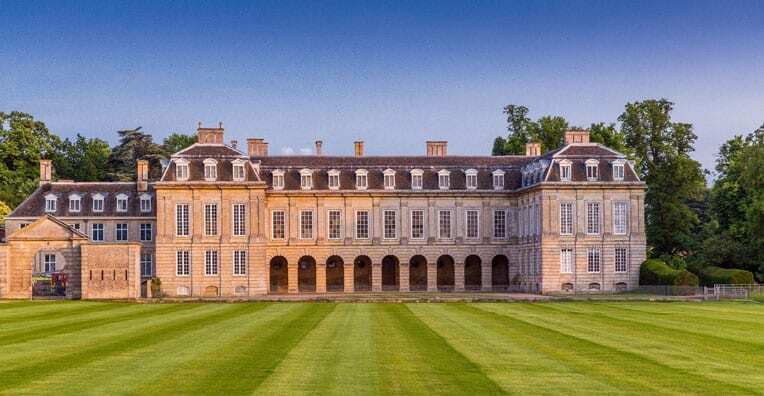 Applications are now being accepted for a fully funded PhD studentship, ‘Antiquarianism, Science and Networks of Knowledge: The Archives of the Spalding Gentlemen’s Society, 1710-1760’. Funded by the AHRC’s Midlands3Cities (M3C) programme, the project operates as a collaboration between the University of Leicester and the SGS. The successful applicant will be able to formulate a topic within the project’s broad remit based on their areas of interest and/or professional experience, and will enjoy opportunities for additional training and opportunities for public engagement and publication. A detailed description of the project and information on how to apply can be found on the M3C website. Closing date for applications is 15 January 2018. This item is not in the museum, but rather on it. When walking past the museum, many may have noticed a ship perched upon the roof. That ship is in fact a weathervane. The weathervane came from the roof of the “Old Ship” warehouse in Double Street. 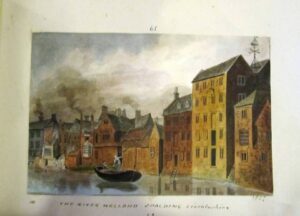 It is shown on a view of the warehouses in Double Street which was painted by Hilkiah Burgess in 1827. When the warehouse was demolished in 1964, the owners generously donated the weathervane to the Society. The vane is made of copper, and when donated it retained some painted colour. 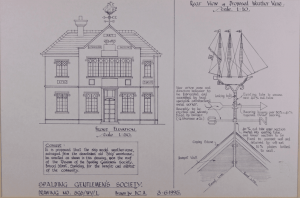 It represents a three masted seagoing vessel, of a type that would have been used to transport goods into and out of Spalding when the port was active. 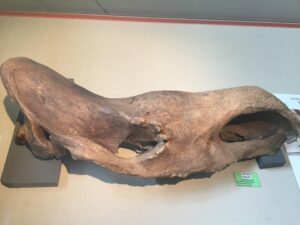 The Society contacted the National Maritime Museum in the 1980s to ask if it might be possible to identify the ship as a specific vessel. The Museum Director replied that it was unlikely to be of any particular vessel, and noted that the flag on the stern was a Union Jack, rather than a Red Ensign which would have been the flag actually flown by an actual merchant ship, suggesting that the maker did not have a specific model to copy. After the donation in 1964, it remained in the Museum for many years while waiting to be erected on the roof. It was finally put in place there in 1996. Apart from the physical problems which had to be solved, detailed permissions had to be given for such a change to the building. One beneficial result was that a detailed drawing of the vane and the building was prepared. 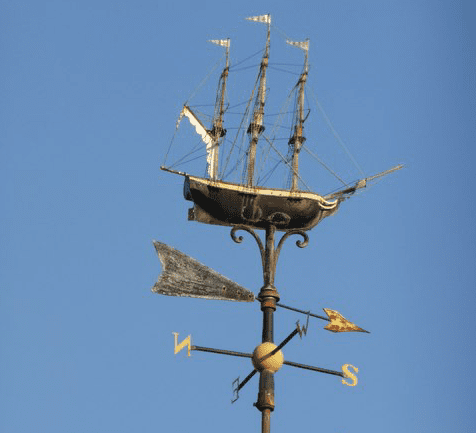 The weathervane now remains a wonderful reminder of Spalding’s history as an active trading port. The Society joined forces with Ayscoughfee Hall to stage this very popular event from 20th to the 22nd of July. We welcomed nearly a thousand visitors who came to see the exhibitions and join in the activities. The feedback from visitors and volunteers alike was very positive. We congratulate Niki Hawley , Julia and her Ayscoughfee team on such a successful venture. Society members Sharon and Ian Hoult put in a colossal effort not just over the event itself but in preparing the displays and corralling volunteers. 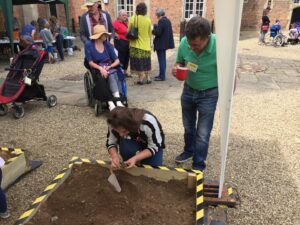 Our physical contribution was in presenting some of the finds from the dig carried out in Healey’s field at Pinchbeck a few years ago. Our curator Marilyn had taken care of these finds from John Lyon last year. It was good to see John at the event and we are very grateful for the opportunity to show the fruits of his labours. Some of the finds were enjoyed and appreciated by the many children who excavated the specially created dig pits. Some of the more precious items will continue to be shown at Ayscoughfee for a little while longer. If you get a chance to visit do take time to admire the stunning reconstructions of early pottery which Sharon has painstakingly assembled from buckets of broken shards. Amazing! We were delighted to be joined on the Friday by Helen and Claire of Focus Consulting. They were able to start on the audience surveys included in our Heritage Lottery Fund Resilient Heritage project. This article contains links to external websites. The SGS bears no responsibility for the accuracy, legality or content of the external site or for that of subsequent links. Members may have noticed electrical and associated works going on at the museum which should finish by the end of this month. We have been able to carry on activities around the work and hope not too much inconvenience has been caused. The work has been funded by The Arts Council through the agency of Museum Development East Midland. This is part of their ‘Ready to Borrow’ Grant project. We have also been funded by the Heritage Lottery Fund with a Resilient Heritage Grant. This grant will fund the advice and expertise of Focus Consulting to research and evaluate our options for the future of the Society. Since achieving Accredited Museum status we have had more success with our applications for outside funding. 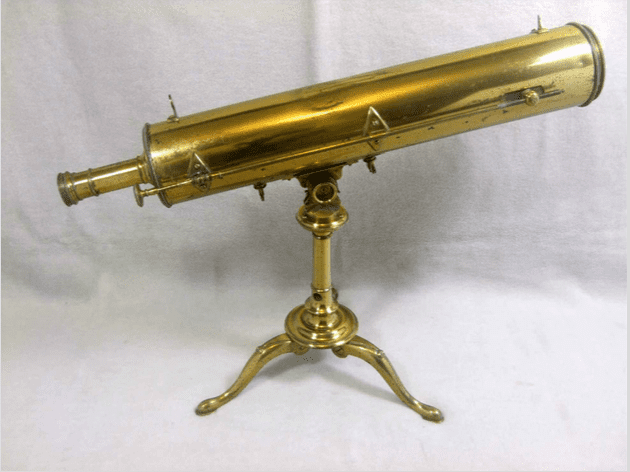 The Pilgrim Trust through AIM (Association of Independent Museums) have given us a generous grant towards environmental monitoring equipment and software. Work is continuing with our Lincoln Records Society Project, digitising our early minute books. All of the outside funding we receive helps us to improve the care of our building and collections. These funds are not available for the core funding of running costs. To meet these, we are hugely dependent on the subscriptions of members and the donations of visitors. Placed on the top of the Shell Cabinet in the Turner Gallery this small, 150 x 100, frame contains an ‘Instrument of Torture’. The caption tells us where it came from and who had ‘worn’ it on a particular date, but little else. So, who was Ethel Taylor; who were her family. I decided to investigate. The 1891 Census (taken on the night of 5 April 1891) show Ethel, 6 years of age, living with her mother and older brother at 78 Winsover Road, Spalding. The mother is entered as a ‘Widow’ with the Occupation of ‘Grocer’. The brother is 11 years older and working as a Grocers Assistant. As the mother is 44 years of age in 1891, Ethel is a late arrival into the family. As the mother was a Widow, when had her husband, George Taylor, died? A quick search indicated only one death of a George Taylor in the Spalding area and he had died in 1883 which, if correct, made it impossible for him to be the father. More research needed. Leaving this for the time being, I concentrated searching for further details of Ethel. The 1901 Census (taken on the night of 31 March 1901) when Ethel was 16 years old, has her far from Spalding as she is now in Greenwich, London working in the household of the General Manager of the P&O Steam Navigation Co. as a ‘Housemaid Domestic’. The house is an elegant Victorian dwelling still occupied today and looks as if it could accommodate the whole of 78 Winsover Road in one room! By the next decennial census of 1911 (taken on the night of 2 April 1911) Ethel had changed her employer and is now working in Blackheath, London as a Domestic House Parlour maid, her employer being a manufacturer of buckram. At 26 she is still a single woman. As no further Census information is available for some years to come, I had to leave that line of enquiry and look elsewhere. I next looked to see if I could find a marriage for Ethel. This was something of a daunting task as I only had one name and no idea where a marriage, if there was one, took place. After several attempts I had to abandon the search there being too many ‘possible’ hits. As mentioned earlier, there was some doubt about the father of Ethel. Her birth certificate has the father as George Taylor yet by the 1891 Census the mother is a ‘Widow’ indicating the father must have died between Ethel’s conception (she was born 6 November 1884) and the Census date i.e. 5 April 1891. So when did George die? 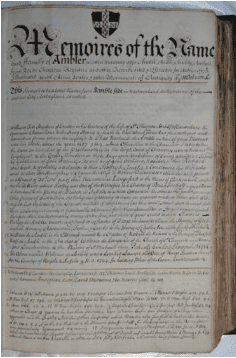 Searching the Registrar General Office Records for a death, the only George Taylor in the Spalding Registration District was in the second quarter of 1883 with an age given as 24. This could not be the person I was looking for as our George would be in his thirties by that time. Turning to another source i.e. The Parish Register for St Mary & St Nicolas, I found what appears to be the same record but with different information viz: George Taylor Buried 23 June 1885 age 39 years. This age fits with ages given in the earlier Censuses and is I believe the husband. So all’s well that ends well (I hope) but, this is by no means certain. 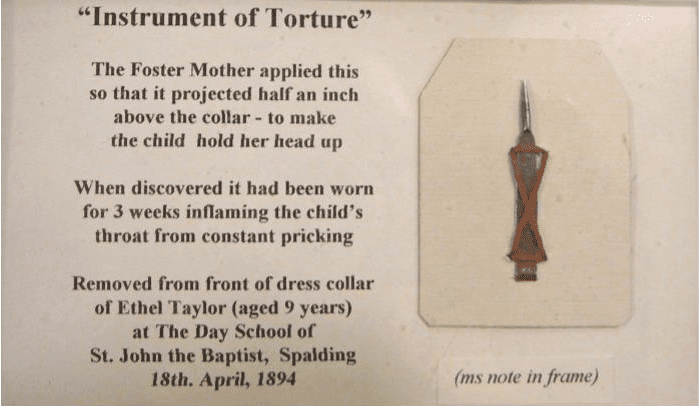 One final comment; the caption states the ‘Foster Mother’ placed the ‘Instrument of Torture’ which begs the question ‘Who was the Foster Mother? Until access to later information is available this question will remain unanswered unless, you have this information.